Bet365 are offering a risk free bet of up to £50 when your bet on a horse in a selected race wins. Basically, if you bet £50 on a feature race and you win, you'll get a risk free £50 bet on the next feature race. And if you bet £50 on an ITV race and you win, you'll get a risk free £50 on the next ITV race. A feature race is a race selected by Bet365 for the offer. There are normally 2 per day throughout the week, and then on Saturday there will be around 7 ITV races. The odds tend to go crazy around 10 minutes before a race, so try not to leave your bets until the last minute! 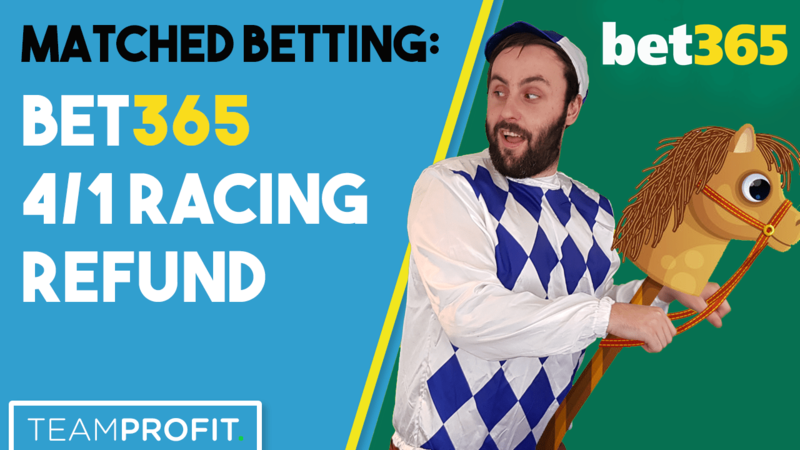 To get the full £50 risk free, you need to bet £50 on a horse at odds of 5.0+ and win. Open up Bet365 and your Exchange and find a close match between the back and lay odds for a horse on either an ITV or Feature race. 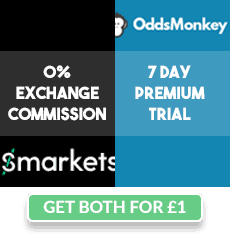 Alternatively you can use Oddsmonkey's Racing Matcher to find a small loss. For a race with 10 or less horses, you want to take no more than £3-£4 qualifying loss (obviously even less will be better!). For races with more than 10 horses you should be looking at a qualifying loss on no more than £2. If doing the offer in the week it's sometimes best to mix stakes up - don't always do exactly £50. If your horse didn't win, you've made a small loss and can move on to the next race. For the next race, just repeat the process by backing and laying a horse and hoping it wins. You don't make anything off this offer until your horse wins. If your horse did win, you will get a £50 risk free bet on the next corresponding race (If it was a feature race, your risk free bet will be the next feature race. If it was an ITV race, your risk free bet will be on the next ITV race). If your horse won on the last Feature race of the day then your risk free bet will be the next feature race - which is likely the next day. If your horse won the last ITV race of the day, then your risk free bet will be the next ITV race which is likely to be the first race the next weekend. Firstly, this is a risk free bet you are using. It is not a standard free bet however the process is pretty much the same. To use a risk free bet, you will place a bet with your own money and receive a refund as cash if it loses. So, find a close match between the back and lay odds of a horse in the next feature or ITV race after the one you won. Back £50 on the horse at 5.0+. To calculate the lay stake, you change the calculator mode to "Free Bet SNR". Place your lay bet with the figures shown on the calculator. If your loses, you are done and will receive a £50 cash refund within 1 hour. You can also now repeat the offer from step 1 on the next race. If your bet wins, you'll get another risk free bet on the next race! Repeat this step for the next race, and keep repeating it until you eventually lose. You will make about £40 every race that you win (until you finally lose). Each time you win, you simply bet on the next race at FREE BET SNR until you eventually lose. Then start from step 1 again. Risk free bet must be placed on the next race. Not every offer - I'd personally stick to ITV racing as it's for more recreational bettors. Betting mid-week may flag your account quicker. Vary your stakes - Don't always go for £50, mix in some £20 to £40 too.